As a busy mom of 3 it’s pretty obvious that I enjoy easy home cooked recipes! If I can use leftovers, that’s even better. The problem with leftovers in my household is that there is 5 of us, so if we do have any left over food it doesn’t go very far for another meal. How do you feed a family of 5 with 2 leftover chicken breasts? 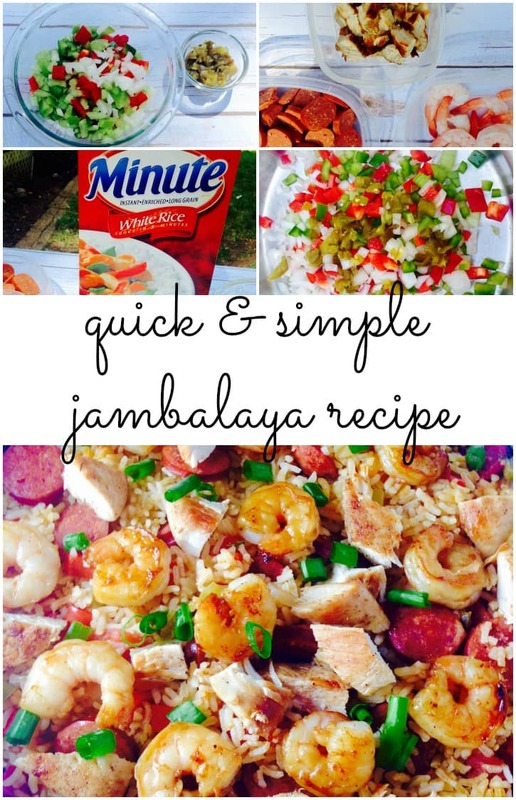 Well, I’m happy to say I’ve partnered with Minute® Rice to bring you this easy Jambalaya recipe that uses up leftovers, tastes absolutely amazing and by adding in some rice I was able to create dinner for 5! You can use just about any ingredients you have on hand to make this dish. In the past, I’ve used ham, bacon, and even pork. This time around I’m using chicken, shrimp and hot links since this is what was leftover from our family BBQ yesterday. Adding in Minute® Rice helps me add a lot more substance to this dish. Remember I have 5 people to feed! 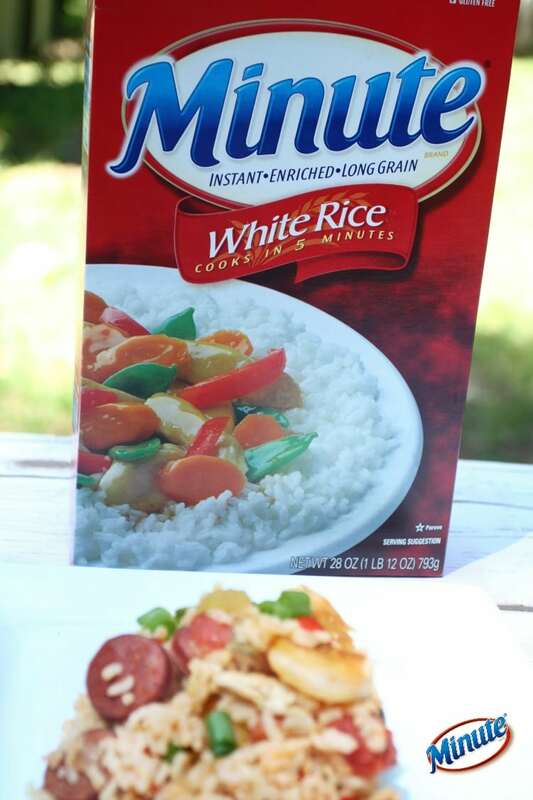 Minute® Rice also helps me take this normally time-consuming dish and cook it in under 30-minutes. Win! The rice only takes 5-minutes to cook and the rice comes out perfect, great-tasting and fluffy just the way rice should be. Dinner’s on the table in 30-minutes with this easy Jambalaya recipe. Heat oil and butter in a large skillet. Add onions, celery, bell peppers and jalapeno to the skillet. Saute for 5 minutes. Add onions, celery, bell peppers and jalapeno to the skillet. Saute for 5 minutes. Add your hot links to the vegetable mixture and cook for an additional 5 minutes. Add fire-roasted tomatoes to the skillet and mix in well. Cook for 1 minute. Sprinkle in your creole seasoning. Pour in the chicken broth and bring to a rapid boil. Once the chicken broth is boiling, add in your rice. Cover, turn off heat and let sit for 5 to 7 minutes. The boil in bag rice packs are my favorite Minute Rice product. That looks delicious! I may have to get some Minute Rice and give this a try. With my family’s busy schedule I love quick and easy meals. Yes, it makes it so easy to have dinner on the table quick. I’m a HUGE fan! This is a lot quicker than my jambalaya recipe. We are going to have to try it! 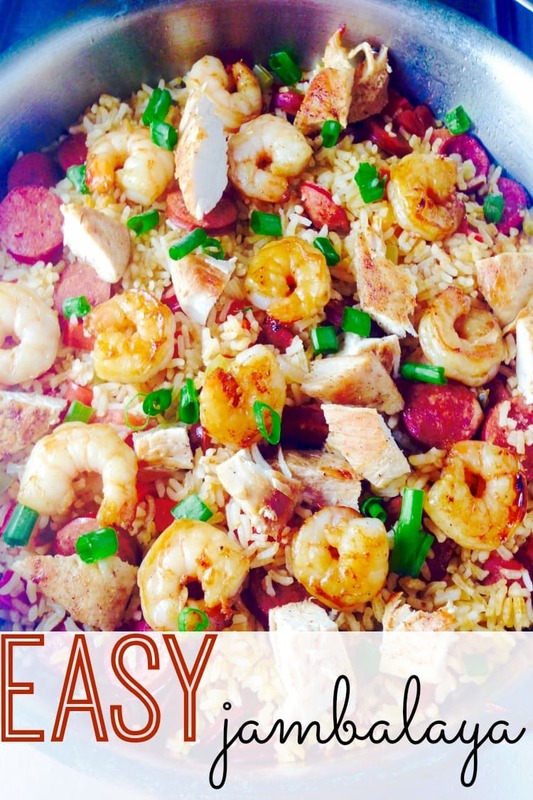 This jambalaya looks delicious! I love shrimp! We all need a little help sometimes getting dinner on the table quickly. Minute Rice has helped me do that too! If I can get a good and quick dinner on the table, I’m happy! Minute Rice is perfect for that. I have a feeling this is going to be a new family favorite! I have always wanted to make jambalaya recipe. This looks delicious. Thanks for sharing with us at Home Matters #homematters linky party. We love having you and hope you join us again. Yum, yum! We love jambalaya! What an easy way to make it. Thanks for sharing at Idea Box! This looks amazing! I’m a huge rice dish mama! Thanks for sharing your recipe on Wake Up Wednesday Linky Party!